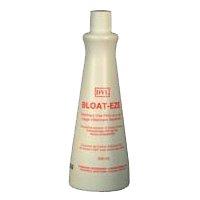 Indications: A peppermint flavoured liquid, Bloat-Go is indicated as an aid in the treatment of frothy bloat in ruminants and in the treatment of constipation. Directions for Use: Administer 340 mL (1bottle) by stomach tube or as a drench. 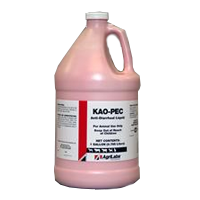 Indications: Kaopeclin is an absorbant used as an aid in the treatment of diarrhea and enteritis in cattle and horses. Administer orally every 2 to 4 hours, to effect. Shake well before using. Adult cattle, horses: 15 to 30 mL per 45 kg. Calves, foals: 15 mL per 10 kg.